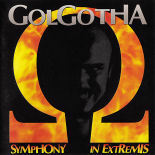 Symphony in Extremis was recorded at Merlyn’s Cave Studios, Malvern Wells and was released on the Communiqué label in 1993. For this album Karl Foster undertook production duties with the engineering assistance of Steve Jay and Rob Murray-Mason. Listen to Symphony in Extremis. You can see images of the artwork that accompanied the CD version of the album in the gallery. Copyright © , The Real Golgotha. All Rights Reserved. | Powered by Etomite 1.1 (Prelude).